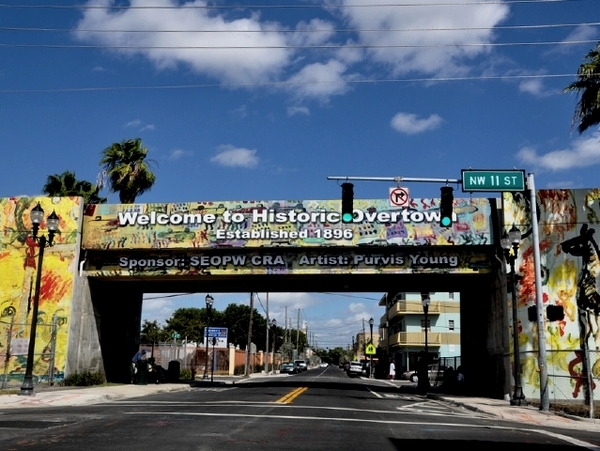 This week on #TheOtherSideOfTheBridge, we are featuring the Historic neighborhood of Overtown and Little Haiti. As you know MUCE is all about bridging the gap between what people THINK Miami is and bringing them into the REAL Miami. This week there are many things happening on the other side of the bridge (outside of South Beach). Here are some our favorite Miami cultural activities that you can indulge in this week. Or any week, really. Little Havana. It is extremely well-known for its art walk. People from all over Miami-Dade, even Broward, comes to Little Havana to visit this historic neighborhood that has been rejuvenated with art blanketing the buildings 8th Street. It is like a crash course in Cuban culture. You can come to 1637 SW 8th St to be a part of Cultural Friday’s. Cultural Friday’s are a time to get swept up by great artistic energy and creative visionaries. Also, there is a FREE art walk featured every second Friday of each month. This is great for anyone who is looking for a night out on the town. It is great for dates, girls night out, out a night out with the family. Whatever the occasion, you cannot go wrong with an art walk in Little Havana! Learn more about Viernes Culturales here. Overtown’s Historic Lyric Theatre was created back in the early 1900s as a way to preserve Miami’s black heritage and be symbolic of black economic influence here in Miami. Located at 819 NW 2nd Ave in Miami’s Overtown neighborhood, the Lyric Theatre is known for its numerous events and programs it has hosted over the years. In addition to being a place where urban arts have been tremendously celebrated and displayed, the Lyric Theatre has been archiving, since the 1970s, materials that reflect the African American experience in Miami-Dade County. Needless to say, there is plenty of art and history to be revered at the Lyric Theatre that everyone living and visiting in Miami should visit. Jackson’s Soulfood restaurant is just that- food for the soul. Jackson’s boosts some of the best soulfood that one can find in South Florida. Jackson’s Soulfood is located in Miami’s Overtown neighborhood at 950 NW 3rd Ave. Jackson’s relaxing ambiance is a great place to come unwind on the weekends. But Jackson’s is not just a great place to go for lunch or breakfast, you can also take the entre family. Jackson’s is truly a family spot. No one is excluded. This is what truly makes Jackson’s Soulfood a community staple. Jackson’s is so well loved that it has been raved about in the Miami New Times and Miami’s online directory for what’s hot in the city- Miami and Beaches website. The Little Haiti Cultural Center (LHCC) is famous for its art exhibitions, art performances, and other programs that serves the Little Haiti community. Located at 212 NE 59th Terrace in Miami’s Little Haiti neighborhood, the Little Haiti Cultural Center is truly a place that brings people together. The LHCC is mostly known for its exhibition of Afro-Caribbean, which is reflection of its surrounding neighborhood, culture. Although the LHCC reflects Afro-Caribbean culture, the LHCC promotes programs for a wide variety of ages, cultures, backgrounds, and educational levels. The cultural center also has an art exhibit that one can visit at any time during operation hors, which is from 9AM until 9PM. Lastly, if you find yourself wanting to host a show of some kind, a shower, or a party, the Little Haiti Cultural Center can accommodate those, too! Follow the Little Haiti Cultural Center’s Facebook page to keep up with the continuous events that happen at the complex. Clive’s Café is that quintessential hole-in-the-wall eatery in the local neighborhood every one loves to visit. Clive’s has it all. Clive’s is a staple in Little Haiti. Clive’s Café, located at 5890 NW 2nd Ave, in Miami’s Little Havana neighborhood is open everyday from 8AM until 9PM. Clive’s Café is infamous for its jerk chicken, curry goat, oxtails and mac and cheese. Another upside to Clive’s is that the eatery also serves breakfast until 11AM. Therefore, you can also get your regular island breakfast foods, such as ackee and saltfish, plus a regular American breakfast. Clive’s has it all! This weekend the MUCE team is presenting another great art exhibition in Miami Gardens. Summer Series, Volume 3: Lavish He-art Exhibit will be taken place in the Finga Licking and Gino Tattoo shopping plaza at 17627 NW 27th Ave. There will be drinks, live music, and MUCE will be presenting our signature art gallery featuring urban inspired art made by Lumpkin, Joe, and Frank Christopher. This is an event you DO NOT want to miss! Trust me. This is event will epitomize the diverse urban culture in Miami. Click here to RSVP. Also, before you leave, check out our culinary win at the Greater Miami Conventional Visitors Bureau (GMCVB). You can also read more about the extraordinary Iron Fork event here. Remember: there is more to see of Miami on #TheOtherSideOfTheBridge . That is it for this week #TheOtherSideOfTheBridge !